Our guide to getting started with the Warlock's take on triggering Mecha'thun. 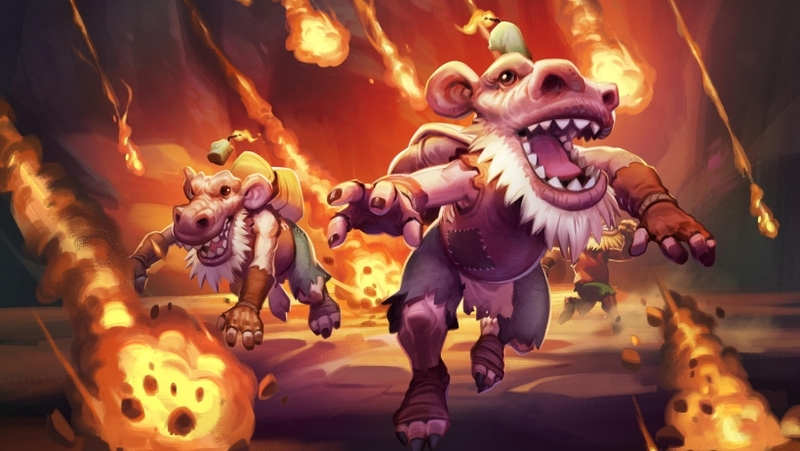 Our Mecha'thun Warlock deck list guide features the best Rise of Shadows deck list for Season 61 of Hearthstone (April 2019). Our Mecha'thun Warlock guide also contains Mulligan advice, card combos and strategy tips. Mecha'thun Warlock is a new Hearthstone archetype to launch with The Boomsday Project, and sees players using the hero's unique tricks of the trade to trigger that devastating Deathrattle effect of the Mech in question. If you're not familiar with how Mecha'thun actually works, it's pretty simple. If you have no cards left in your deck, none in your hand, and Mecha'thun is the only friendly minion on the board, he'll instantly obliterate the opponent when he dies. It's quite a puzzle for each hero to work their way through! In the second edition of our Mecha'thun Warlock guide, we've got an overview of a solid deck list that's been tried and tested in the live meta. We've also got a snapshot of the strategy involved in playing it, followed by a few tips on the Mulligan phase, then a breakdown of the combos contained in the list. If the deck proves successful, we'll update all areas of it over time. When we know what a refined version of the deck list looks like, we’ll be overhauling this article completely. Everything below this point refers to a previous version of the guide, and will be updated as soon as we can. To the best of our knowledge this is the most consistent version of Mecha'thun Warlock you can play right now, although it's far from a top-tier deck. Still, this is about as good as it gets if you're determined to ladder with this one! Your first job is to thin down your deck as much as possible using your Hero Power and cards like Kobold Librarian. You also have powerful cards like Defile, which you can utilise to keep the opponent at bay, and potentially trigger huge draws off Acolyte of Pain. Just watch your maths, and factor in the potential of Bloodmage Thalnos while you're at it! You can use The Soularium to thin your deck faster when you reach the late-stages too, but make sure you have Mecha'thun in-hand first, and can play the Galvanizers after you've drawn them (see below). When Mecha'thun is in your hand, you play two Galvanizer minions to reduce its cost to eight Mana. On the next turn, you drop Mecha'thun, then cast Bloodbloom, then cast Cataclysm to empty your hand, obliterate Mecha'thun and win the game. That's the very rough overview of playing the deck, then, but you'll find more detailed advice in the combos section towards the bottom of this article. If the deck proves competitive we'll flesh out all areas of this guide to help you handle specific match-ups. 1. Kobold Librarian - A fantastic Turn 1 play that not only gives you board presence but also helps you begin the process of drawing through your deck. 2. Novice Engineer - More card draw and something to contest the board with. 3. Acolyte of Pain - Any damage this minion takes will cause a card to be added to your hand. A potentially great play with Defile too. 4. Corpsetaker - A solid mid-game minion that should provide some protection and health restoration. If you're unfamiliar with this kind of deck, it's worth having a read through all the card synergies contained within it. - When Defile is cast, one point of damage will be inflicted against both friendly and enemy minions. If anything dies as a result, the spell is cast again. This repeats until no minions die from the repeat damage. - Galvanizer is a key card in this deck and both copies should only be played to reduce the Mecha'thun that's sitting in your hand. - In its most basic form, Lesser Amethyst Spellstone does three points of damage to a target minion. If you take damage from your cards though - such as Hellfire - while it's in your hand, that damage output increases to five. Take more damage and the Spellstone maxes out at seven. - When the Soularium is cast, you'll draw three cards from your deck. If you don't spend them on the same turn, they'll vanish when it's over. Don't make this play until you have Mecha'thun safely in hand. if you play it with Galvanizers left in the deck, be sure you have the Mana to play them right away. - Think through your maths a second time before casting Lord Godfrey. You're looking for a board state that offers as close to a 2 / 4 / 6 / 8 / 10(!) trigger position as possible. If you can partially trade in order to set this position up across both sides of the board, then do so. - For the sake of thoroughness, we'll remind you of the Mecha'thun combo. You reduce his cost with both Galvanizers, clear out your deck, ensure he's the only minion on the board, then drop him with Bloodbloom followed by Cataclysm.